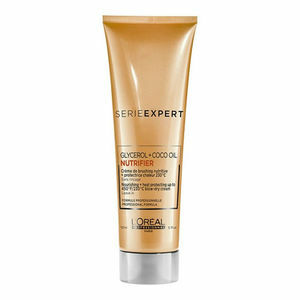 Deep-conditioning and hydrating protective cream for dry hair. L'Oréal Professionnel série expert NUTRIFIER Blow Dry Cream is a rich treatment that nourishes dry hair whilst protecting it from the frizz-inducing effects of hot electrical styling. A wonderfully caring product, this deep conditioning cream works hard to hydrate hair, giving heat protection up to 230°C to keep hair safe from the damaging effects of straighteners, curling irons and hair dryers. NUTRIFER Blow Dry Cream's silicone-free formula contains glycerol and coconut oil to seal in moisture, repair weak fibres and replenish essential fatty acids, leaving a healthy-looking shine and touchably soft locks. £11.52 (inc. VAT) Why no VAT? We're a trade wholesaler and quote our prices without VAT to help our VAT-registered customers understand the true cost of a purchase. Glycerol and coconut oil combine in a caring, nourishing conditioner designed to enhance and hydrate dry and undernourished hair. Comes in a 200-ml or 1000-ml bottle. Reduced to clear! Last few remaining of 150 ml and 750 ml in old packaging! Save 20%! Silicone-free melting hair mask that's full of nutrition and care for dry hair. Comes in a 250-ml or 500-ml pot. Reduced to clear! Last few remaining of 200-ml size in old packaging! Save over 25%! Caring, nourishing shampoo made with glycerol and coconut oil to enhance and hydrate dry and undernourished hair. Comes in a 300-ml or 1500-ml bottle. Reduced to clear! Last few remaining of 250-ml size in old packaging! Save 20%!